Unfortunately there is no information about Kremstal DAC available. One of the eight specific wine regions in the Austrian state or generic wine-growing region Lower Austria, It is located to the east adjacent to the Wachau, The named after the river Kremstal extends north and south of the Danube and includes the city Krems, the more easterly areas and the small wine communities south of the Danube. It is a very old wine-growing region, already from the year 973 vineyards of the diocese of Passau for the Kremstal be attested. After the ravages of the Völkerwanderung, bishops from Salzburg and Bavaria cultivated vineyards from the 10th century onwards. 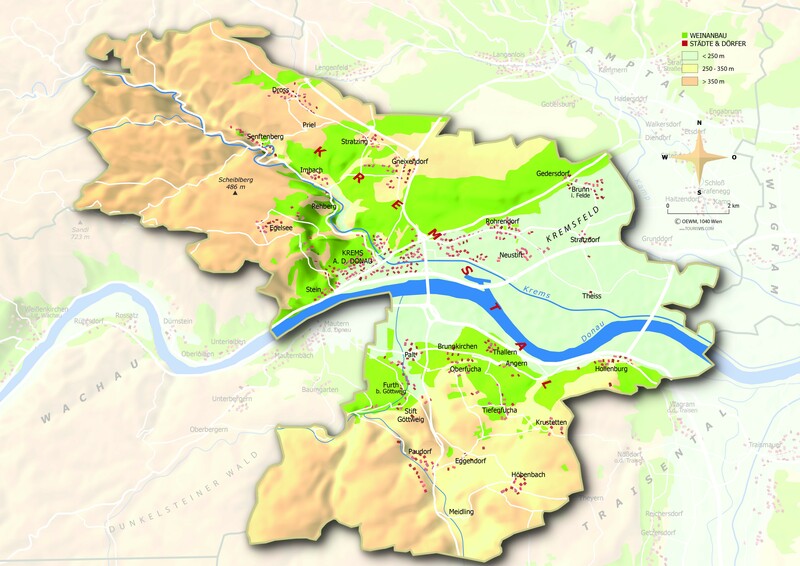 Over 40 monasteries located around the city of Krems were awarded vineyards as a foundation until the 16th century. The French emperor Napoleon (1769-1821) visited in 1805 before the occupation of Vienna Stift Göttweig and loved the area and the wine. The Austrian composer and confessed wine lover Joseph Haydn (1732-1809) allegedly got the inspiration for his "Mariazeller Mass" in the same pen. Strongly connected to the area is the 1000-year history of the winemaker dynasty Moser. The Austrian wine-growing pioneer Laurenz III. (1905-1978) from the community Rohrendorf near Krems led from the year 1929 created by him training systemhigh culture in his vineyards, which soon became a standard. When soil type prevails primeval rock and loess. The relatively cool and humid Atlantic climate is positively influenced by the influence of the Pannonian climate. Especially the deeply cut Danube valley is climatically favored. 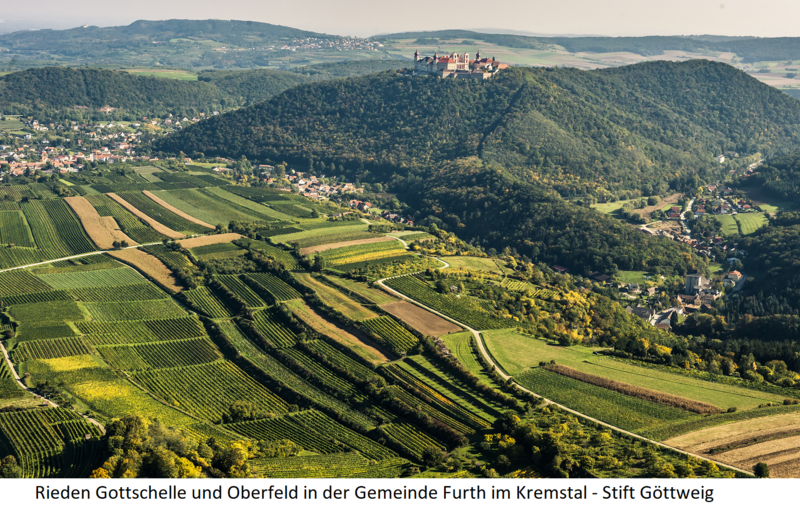 In the larger, counting to the Waldviertel, northern part of the viticulture center Krems with the district Stein with the vineyards Frechau, Goldberg, Danzern, Grillenparz, dog. Kögl Marthal, Pfaffenberg. sandpit, Fright and Wieden, Further communities are Gedersdorf (Geppling, Moosburgerin, Reisenthal, Spiegel, Steindl, Tiefenthal, Weitgasse, Wieland, Zehetnerin), Rohrendorf ( Gebling, Breiter Rain, Paschingerin, Schnabel, Steinwandl, Wolfsgraben) and Senftenberg (Ehrenfels, Hochäcker, Pellinger, Pfenningberg, Rammeln). In the southern area over the Danube on the right bank is the world-famous founded in 1072 Benedictine pen Göttweig. The wine-growing communities located here are Brunnkirchen and Thallern (Brunnfeld, Frauengrund, Herrentrost, Maring, Satzen, heavy cones, Steinhagen), Eggendorf, Furth-Palt, Krustetten, Höbenbach, Hollenburg, Meidling, Oberfucha, Tiefenfucha, Paudorf and Steinaweg (Brunngraben, Eichbühel . Gottschelle, Hahn, Höhlgraben, Oberfeld, Point, Schrötten, Steinbühel, Upper and Lower Zistel, Wolfsberg). In 2015, the vineyards covered a total of 2,369 hectares of vineyards. Compared to 2009 with 2,243 hectares, this was an increase of 6%. The proportion of red wines is 17.9%, the proportion of white wines 82.1%. It dominates with more than half of the stock Grüner Veltliner, followed by Zweigelt and Riesling. From the year 2007, the quality- controlled Kremstal DAC was introduced. All other quality wines have to deal with the origin of Lower Austria, the Vins under the wine-growing region name wine country be marketed. In addition to the generally valid DAC conditions Special rules apply. The wines must taste a characteristic typicality respectively. For Grüner Veltliner : fruity, fine wort, none botrytis, no noticeable wood tone ( toast flavor ) balanced, Not heavy on alcohol, For Riesling : gossamery. aromatic. elegant. mineral, no Botrytis dominance, no wood color, balanced, not alcoholic. For reserve : strong style, pronounced area and variety aroma, dense and long in the leaving, a delicate botrytis and wood tone is allowed. 2017 Kremstal DAC Grüner Veltliner Reserve Dry, Urgestein-Löss & Schieferterrassen "Urknall"
2017 Kremstal DAC Krems Gebling Grüner Veltliner Reserve Dry, "Lössterrassen"
2017 Kremstal DAC Riesling Reserve Dry, Urgestein, Löss & Schieferterrassen "Urknall"